OutRun is a classic Sega arcade racing game. But what if it was also a car? That you could drive? Did I just blow your mind? Garnet Hertz is what you would call a "contemporary artist." In layman's terms that means he spends his days building gadgets that are both functional and incredibly cool. Luckily for the purposes of this article, Hertz is also a fan of classic arcade games. 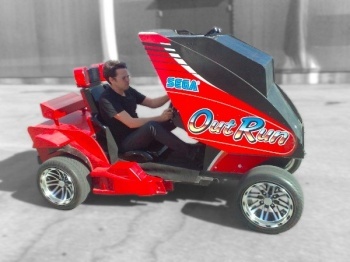 Hertz' latest project forcibly combines Sega's OutRun arcade cabinet, augmented reality software and a golf cart. The result? A videogame that you play by driving through the real world. Cool game, or coolest game ever? That's the question we were asking ourselves when we first came across Garnet Hertz's augmented reality-based OutRun project -- a concept car that weds Sega's classic driving game with an electric golf cart, allowing players to navigate their way around real-life courses using only arcade consoles. Hertz, an informatics researcher at the University of California Irvine, has since brought his idea to fruition, after outfitting the system with cameras and customized software that can "look" in front of the car to automatically reproduce the route on the game cabin's screen. The map is displayed in the same 8-bit rendering you'd see on the original OutRun, with perspectives changing proportionally to shifts in steering. The cart maxes out at only 13 mph, though speed isn't really the idea; Hertz and his colleagues hope their technology can be used to develop game-based therapies for disabled users, or to create similarly AR-based wheelchairs. Admittedly, driving this thing around is the antithesis of safe. Actually taking it onto the streets seems like a pretty reliable form of suicide by oncoming truck. That said, Hertz' game sure beats anything I've ever constructed. I once built a rocket out of Legos, but my dog ate it.